Combine chicken breasts, broth, diced jalapenos, jalapeno seasoning, onion powder, and garlic powder in a 1.5 to 2-quart slow cooker. Cook on Low until chicken is tender and no longer pink in the center, 4 to 10 hours. An instant-read thermometer inserted into the center should read at least 165 degrees F (74 degrees C). Drain liquid from the slow cooker and reserve. Shred chicken in the slow cooker using a fork. Add some of the reserved liquid as desired. Stir in sour cream, cream cheese, and pepper Jack cheese. Cook on Low until flavors fully combine, about 30 minutes. 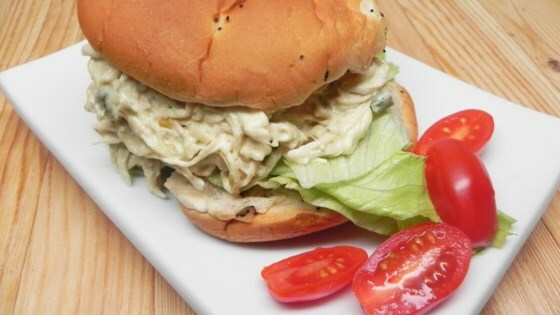 Stir well and serve in sandwich buns. Green chiles may be substituted for the canned jalapenos. Monterey Jack cheese may be substituted for the pepper Jack cheese. Tortilla chips may be substituted for the sandwich buns.